We’re not ashamed to admit that sports have never really been big around here. When you’re busy geeking out over the latest bit of quantum computing news it’s hard to focus on basketball. 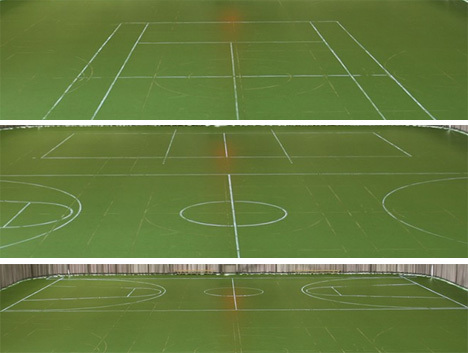 So it’s not surprising that we’ve always had trouble telling the difference between all of those different lines on multi-purpose sports courts (which we’ve been forced to visit thanks to various gym coaches, significant others and…ahem, marching band directors). Even making them different colors doesn’t help much; the mess of differently-colored lines is still way confusing. A Dutch company called LEDSSPORTS wants to make it easier to figure out which lines go for which sport – by making the lines all high-tech. Their product is a bunch of LEDs embedded in the flooring that can be switched on or off depending on the sport being played. Finally, junior high kids can stop screaming at the coach about which line means “out” for tennis and which one is for the volleyball court. 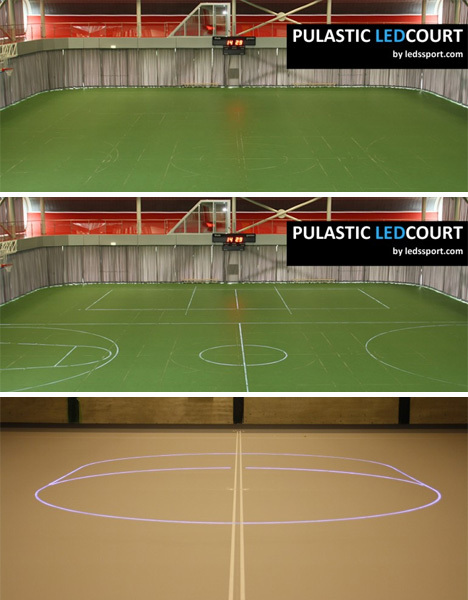 The awesome LED-embedded floors could even be used for other applications like guidance systems or interactive gaming. But we’d like to see this type of floor start popping up in homes. How awesome would it be to program a message for your SO into the floor so it’s the first thing she sees when she gets home? Romance: game, set, match. See more in Industrial Design or under Technology. September, 2011.